These ideas aren't revolutionary, but my daughter has been looking for more things to do lately while my son is at preschool. We did two very very simple toddler ball activities last week that were big hits. I love activities that need very few materials and use what we already have around the house. Materials Needed: balls of various sizes, ramp (we used a foam board), tape, and a large bowl. We grabbed some balls that were different sizes and textures from my apothecary jars that are in the family room and put them in a big bowl. Then we used painters tape to secure the foam board to our small stairs. You could also do this off the couch or a small chair. Instead of foam board you could use the side of a cardboard box or a cookie sheet. Take the balls out of the bowl and roll them down the ramp! Collect them and repeat again and again! My son wanted to try out the activity when he got home from preschool and my kids played for a long time! We talked about the different sizes, colors, and textures of the balls. We also talked about how fast/slow they went, the directions they moved, and how many we picked up! My son liked counting how many he could pick up all at the same time and how long it took him to collect all the balls. This game reminded me of my son's favorite activity when he was two- shooting two. My daughter is about 18 months now and loves to drop things into buckets or dump them out of buckets. This game let her do both. We used the big and little decorative balls from around my house (I just had to remind my daughter once or twice not to squish them... since they are more delicate that some of my other balls). For this activity all we did was drop the balls into our large bowl and then dump them out and do it again. To me it sounds like a boring activity... but to an 18 month old it wasn't! Toddlers love repetition so we did this again and again and again. We also used some plastic cups to scoop up the balls from the bowl and dump them back in. We talked about the sizes of the balls when she scooped them up with the cup. Some balls fit and some didn't... so it provided a good opportunity to talk about why that happened and problem solve together. 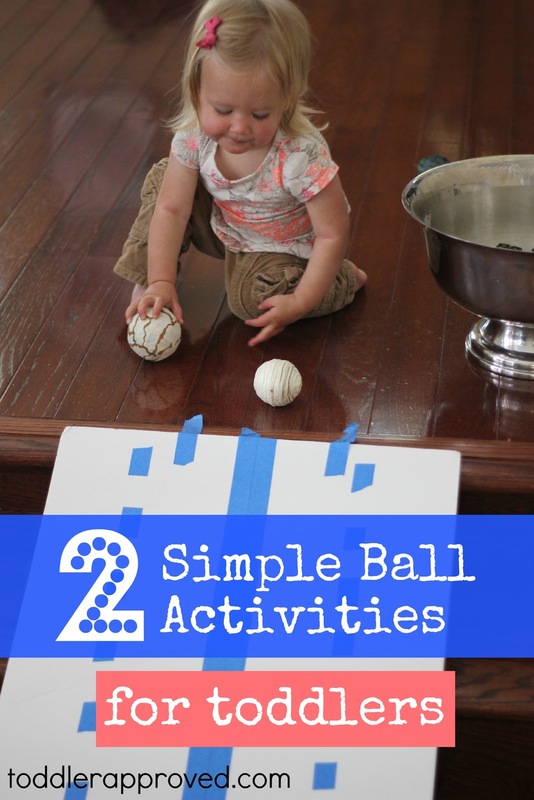 Do you have any other favorite ball activities to do with toddlers? What is your toddler's favorite activity to do with you? My older daughter would love both of these activities. She loves balls :) Thanks so much for sharing with Tuesday Tots!